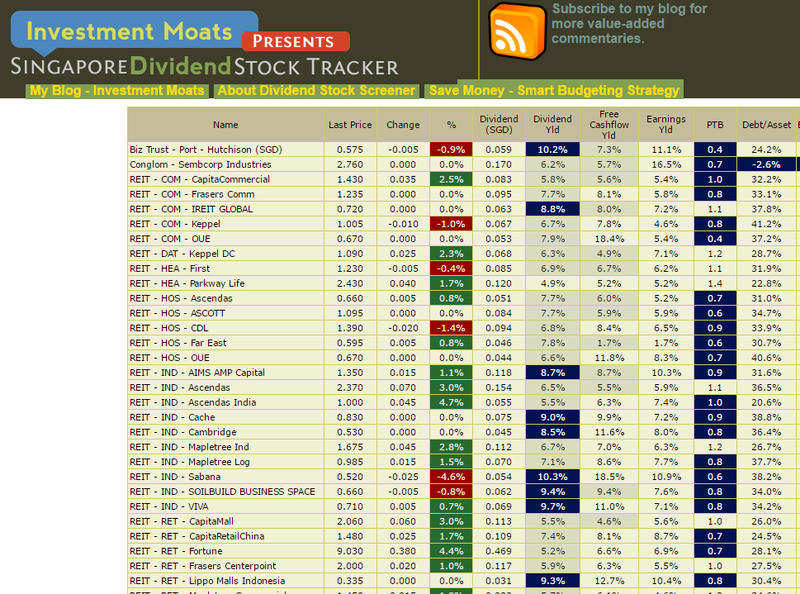 Most readers would know that I maintain a list of very popular high yield dividend stocks in Singapore. You can see the dividend yield, and how the dividend yield fluctuates as price changes. You can see its EV/EBITDA and its net debt to asset, to assess how leveraged they are. For some time, I kept getting the high yield are not cheap argument. Perhaps it depends on the context of what other stocks they are comparing to. Or the time period they are compared to. Interest rate is rising, so what is an average yield in the past, say a 5-5.5% dividend yield for Singapore based office properties, 6.5-7.5% dividend yield for industrial properties are not considered fair value. However, high yield dividend stocks, if they do not have a business behind it, tends to be interest rate sensitive. They are definitely not too expensive. WE have something of #1, #2 and #3 affecting them. Many have a 14-20% draw down from peak prices. M1‘s peak was closer to was closer to $4.00 in Feb 2015 and its been on a down trend. Current price is at $1.55. A 61% draw down. Hutchison Port Holdings HPH, the USD one, IPO at US$1.01 in 2011 and its been on a down trend for 7 years. Current price is at US$0.29. A 71% draw down. If you have a pre-conceived notion that dividend stocks are safer, less volatile, that dividend makes up for it, chances are they are not as safe as bonds, less volatile as you imagined. You can lose your pants off as a retiree if you are looking at high yield dividend stocks, as high yield bonds that default. Dividend will make up for it, if the business and fundamentals are intact. When prices are down, it does present an opportunity. It means things are not as expensive as last time. However, that does not mean that they are attractively valued either. If there is one thing working in these stocks favor, in terms of appeal, is that the narrative of rising interest rates, poor demand and supply, business fundamentals and falling stock prices, have created a negative narrative. Its always better to look at times like this then when things are always bullish. You know that more or less, a lot of these companies have their pants down already. More are showing weakness than strength. 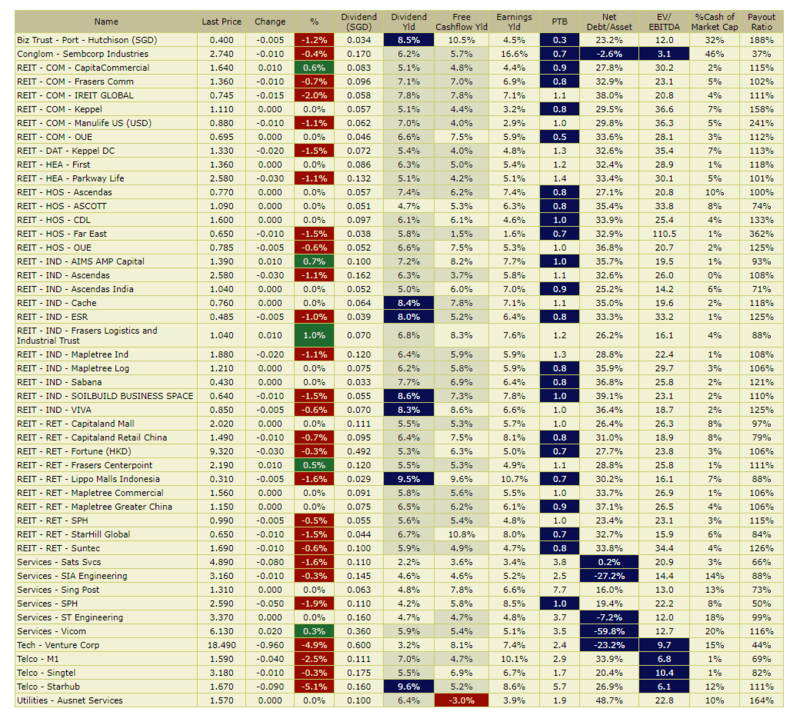 A lot people have good returns from these stocks that have large draw downs. A lot of people get caught and lost money in the same stocks as well. What is the difference here? Share with me your experience. Inconsistencies in rental revision computation may give investor an over-optimistic or pessimistic impression of the property situation as well as manager’s ability. 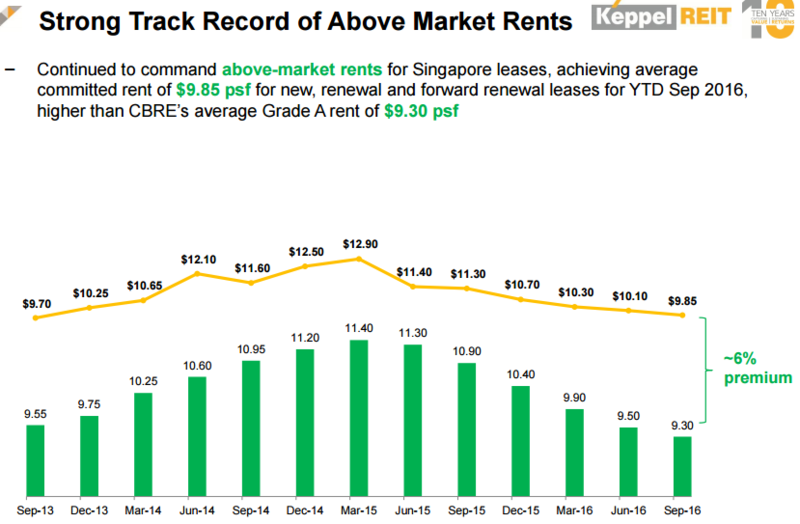 Recently, Prime Grade A focused commercial REIT Keppel REIT (dividend yield 6.3%) made an annoucement regarding the way they compute their rent reversion. 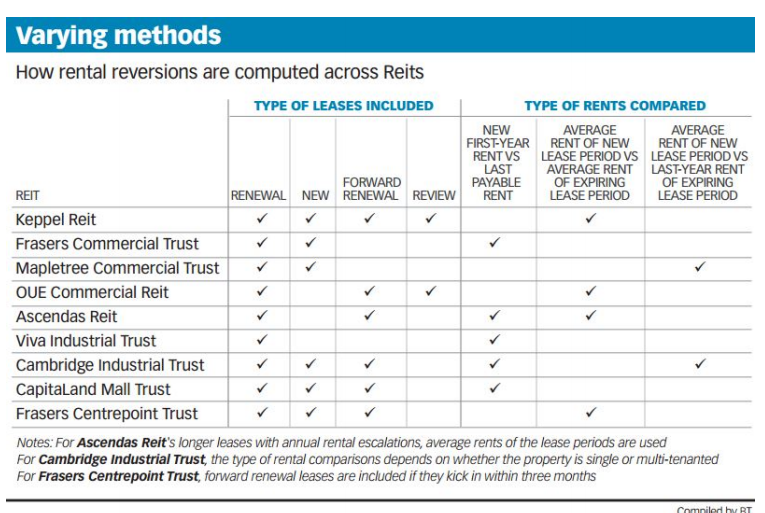 Underlying REITs are different properties that the REIT rent out. These lease terms could range from short of 1 year to as long as 20 year (for some of Keppel REIT’s Australian properties for example). When the term expire, the tenant and the landlord have to negotiate for a new rent for the renewal, and other details such as how long to rent for, incentives, and other terms. During good times, when there is limited supply and booming demand, the rent reversion can be high positive. During bad times, where there is more supply and demand is low, rent revision likely will be negative. Rent reversion therefore depends on the demand and supply environment, the quality of the property, managers ability and other factors. The impact to the investors is that this affect the dividends per unit you will receive going forward, whether for the better or worse. It also affects the intrinsic value of the REIT, since the value of the REIT is the aggregate of the discounted cash flow of the collection of assets. In 2016, the 4 quarterly financial announcement put Keppel REIT’s management in a very good light. It show them navigating very well in a challenging environment where supply is increasing and demand is going down. This announcement reveal inconsistency in the way rent reversion is being reported. 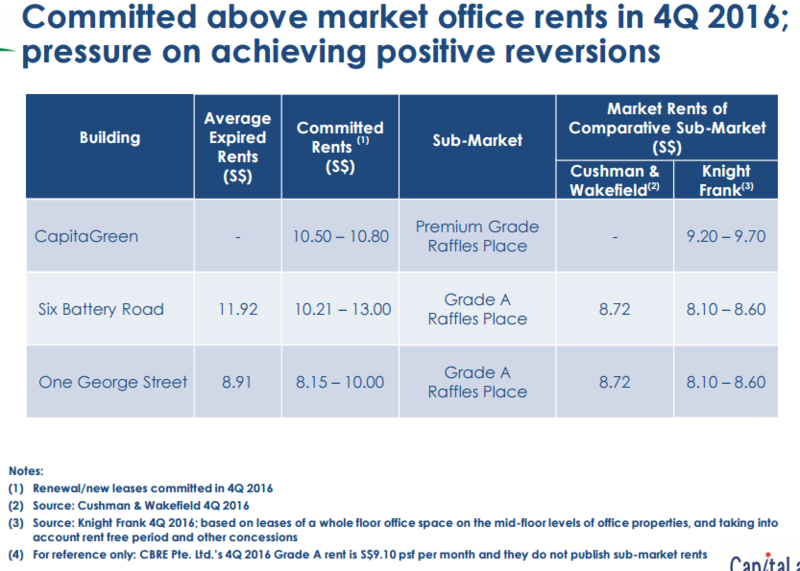 By using different methodologies, the rent reversion swings from positive to very negative. 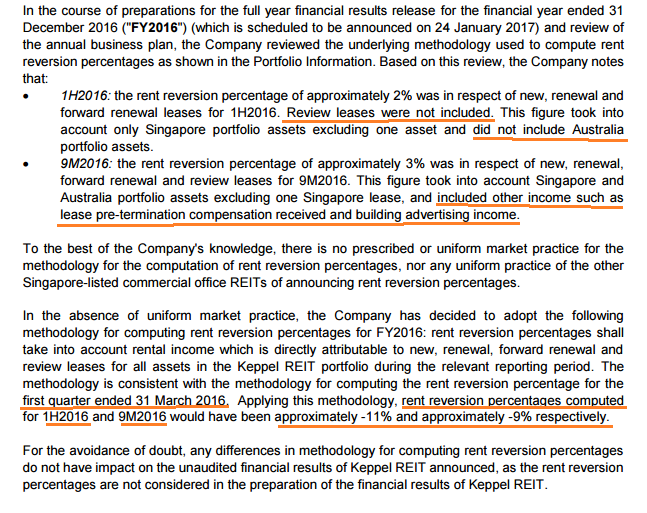 In Keppel REIT’s case, what was not included was the review leases. Review Leases refers to the tenants on long leases. Typically due to the long leases, the landlord will embed a 3 year, 5 year or half the term rent review. 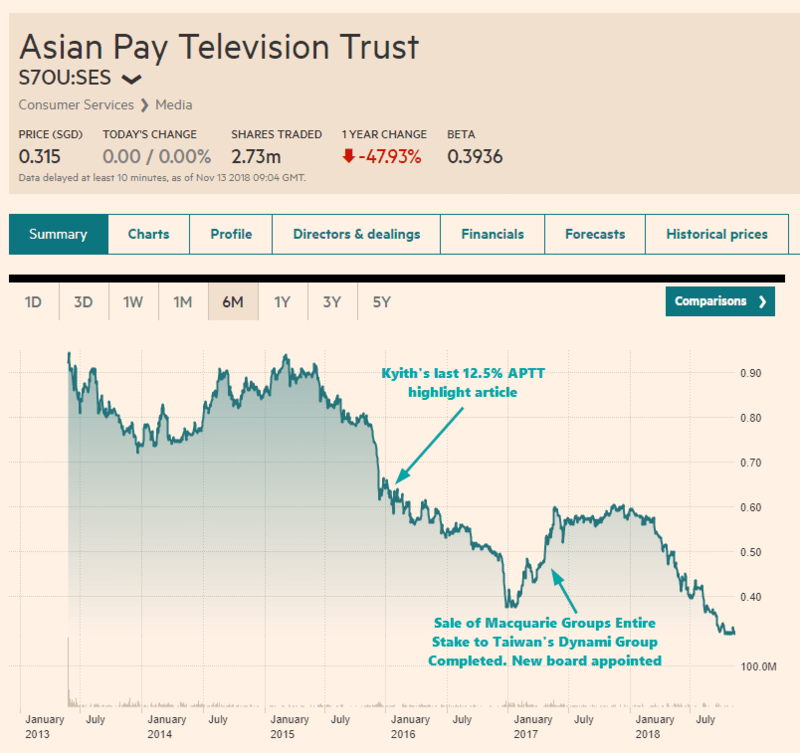 The ones most famous in the news would probably be Toshin legal tussle with Ngee Ann City, Starhill Global REIT. Keppel REIT’s Singapore portfolio was included excluding 1. Their Australia Portfolio was not. The very strange thing is, prior to the last 2 quarter (Q1 vs Q2 and Q3), the reporting was totally different. 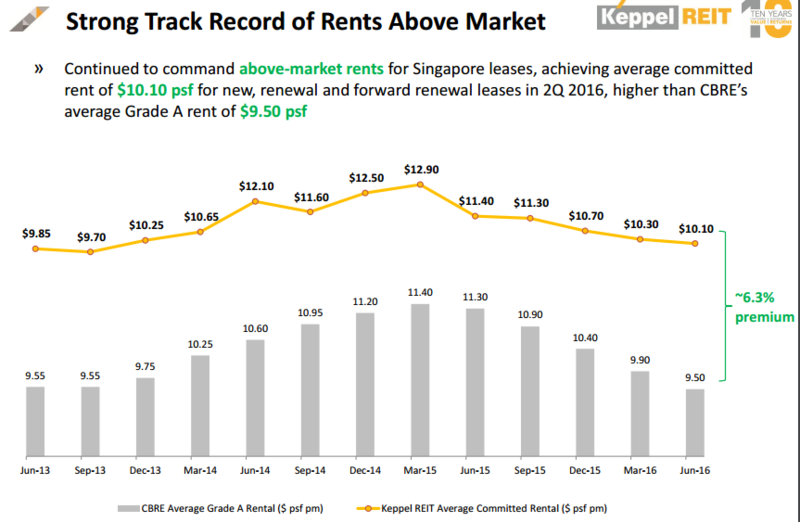 The narrative isn’t very clear on Rent Reversion for Keppel REIT. You wonder if that is deliberate. You can choose what you do not say. However, it should be noted that the Australian portfolio made up a small amount of Keppel REIT’s net property income. And in theory, the leases did not expire! Keppel REIT reports that they will change their methodology back to how they compute in Q1. The REIT managers tend to agree if in the property there is only one lease renewal among many leases, it is better to exclude this lease from calculation. The reason seem not that its pro-investor, but it would expose who the tenant is. You basically see the problem here. What is included is one thing, how to compare is another. 1) I find it conservative to use new first year rent versus last payable rent. I think this one reflects the cash flow well. 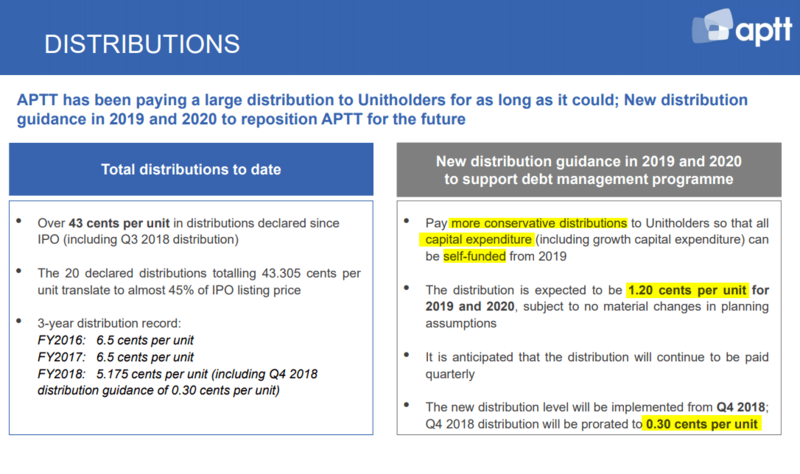 If you are a REIT with rental escalation such as Frasers Logistics and Industrial trust, or Keppel REIT’s 20 year Australia Office that is up for renewal, and their last year payable rent is higher than the market rent (due to the actual economy growing slower than the rent escalation) then this revision will be very telling. 3) But I think what MCT and Cambridge did is the best because they essentially marry the 2 above. 1 and 3 seem to satisfy this. The biggest impact for investor will be, we do not know which method of rent reversion the manager is using. We always thought its the same! Had Keppel REIT not made that announcement and Business Times have not done the good work, novice investor like myself might be framing the prospects of these REITs wrongly. As an investor, your job is to figure out the forward looking cash flow prospects and the business prospects. Now that we know it is not so clear cut, it means that you can follow up with investor relations, or ask during AGM meetings questions related to the rental reversion in detail. The main thing to find out is to have a picture of the forward rental cash flow that is untainted by as much doubts as possible. for this reversion info, what makes up what was computed, are there notables that was not included? Lastly, don’t take it that if the rental escalation is 3%, you are going to see the income available for distribution go up 3%/yr. It does not always translate directly. In many instances, the landlord do give incentives (money or intangible) so that the tenants continue to stay with them. 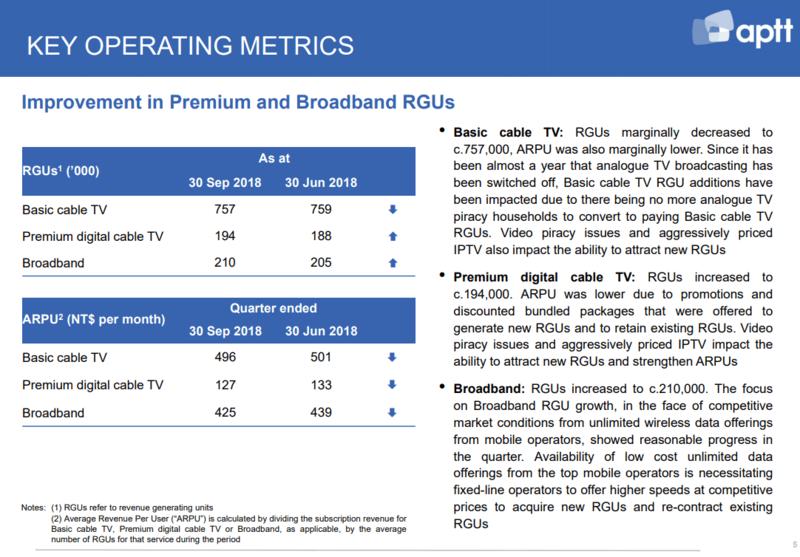 Net net, the growth may even be negated. In my last post, I talked about why I sold off Croesus Retail Trust and decide to observe this stock from afar. Croesus retail trust is a business trust listed on the SGX currently with a dividend yield of nearly 10% on a high debt to asset leverage. It invests in Japan malls which have rather long master lease with rental escalations. The typical Net Property Income yield is around 6% to 7%. Since my article, management have taken 2 actions. They have taken 2 actions. The first one is to acquire two more malls, and with the first mall purchase, the three malls come with an average NPI Yield of 7.1%. The second is propose to do one more rights issue to internalize the management team. The first action to purchase the mall answers my question that the capital raising done previously was not accretive to existing shareholders. With this deal the existing share holders would see their forecasted dividend yield go up. It is the second action that is hotly debated. By internalizing the management team, this means that Croesus Retail shareholders will buy over the management team, instead of the management team being owned by the sponsor. Internalizing the management team theoretically is good. When the team is owned by the sponsor, the management have an economic bias to work for the sponsor, that means gobbling up any mediocre deals of the sponsor, justifying to the shareholders these deals are good. 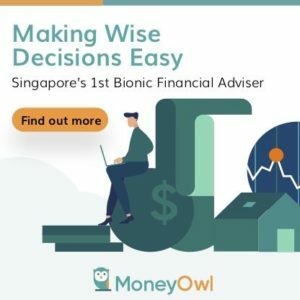 By internalizing, there are cost savings as explained by Croesus in that acquisition and divestment fees, performance fees that are usually paid to the management can be saved. Secondly, the management team are under the watchful eye of the shareholders and may be removed more easier. However there are some possible problems I see as well. If the manager do not do a good job, is it possible to find a manager that can risk manage, operate and at the same time able to tap more deals that are attractive? You do need someone rather connected and experience in this. This person could possibly be a second in command in another developer who didn’t get a chance to rise to the top. If the majority of the ownership still falls in the main shareholders and they control on the voting rights, it might not be that different from an external structure. REITs that have a sponsor are part of their asset recycling strategy. If a developer sponsor have a building they want to sell, they will see if there are sovereign funds, private equity funds that are willing to pay a good price. If not, they sell to their owned REIT to realize at what they deemed full asset value. If you lose your sponsor, you rid of this property dumping problem to an extend. However, you introduce the “how do I find assets to grow” part. It is really up to the manager to find the good deals, that people do not want, or under the radar. A downturn will increase the mispricing of assets, and be good for internalized manager. 4. Why would the Croesus Sponsor sell off a Traditional High Return on Capital Business? Asset managers are high return on capital business. In the case of reit managers, such as ARA Asset Management in their early days, the capital outlay is low to manage more assets. For such a business it is not easy to find it listed. If you have something good you keep it to yourself, why share it with others unless you need visibility to gather more assets or tap the debt market better. Possible conclusion for this I can think of is that it is quite difficult to be an asset manager with such a theme focus on Japan retail. They want to be out of this game. At this point, they are finding it extremely tough to raise capital. Their cost of equity capital is at 10%, their debt leverage is very high, and they cannot attract Japanese investors to buy preference securities in a low yielding environment. Another possible reason is with the new rules, specifically compliance laws, make cost for the manager to be high enough that it is not lucrative any more. 5. 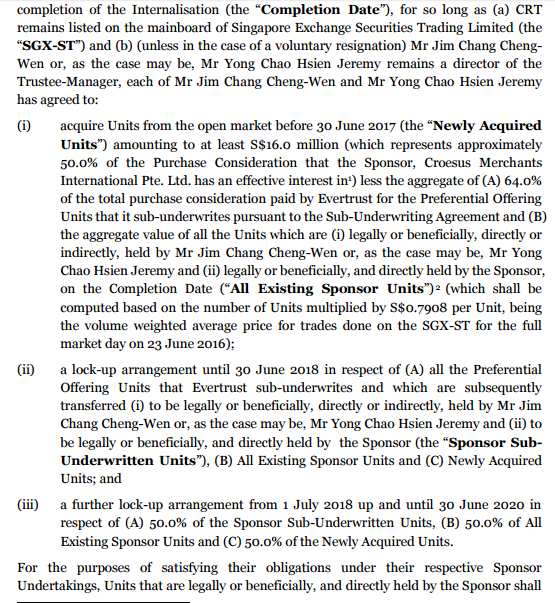 Was the internalization at SG$50 million expensive? When I first look at the internalization I thought it was rather expensive. 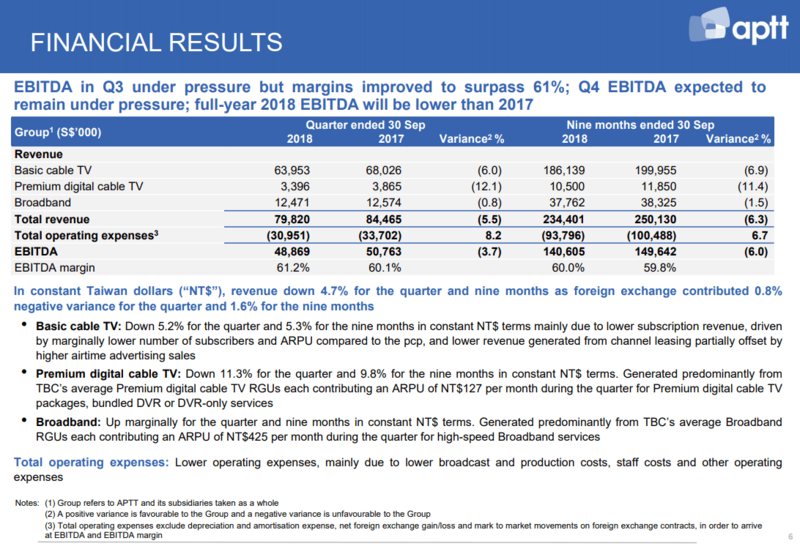 The left column shows the profit and loss in the work year and the right column shows the proforma after the shareholders see the benefits. 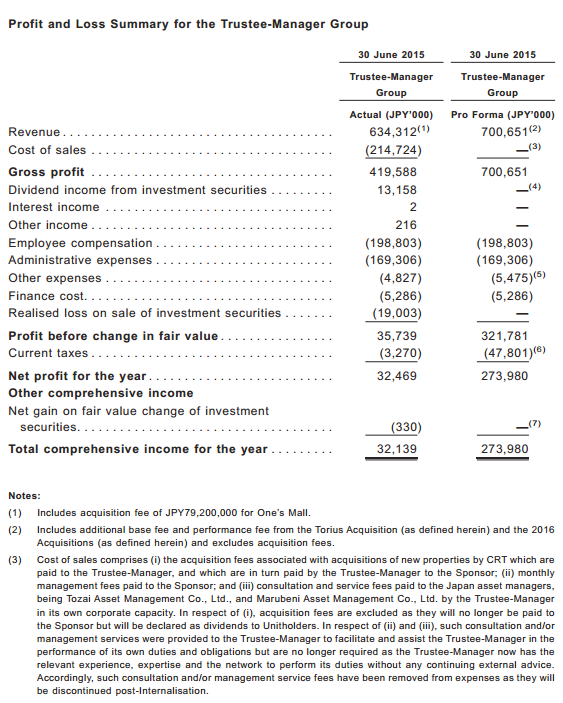 The main bulk of the savings is the JPY 213 million in cost of sales which is made up of acquisition fees to be paid to trustee manager of the sponsor, monthly sponsor management fees, consultation fees for school lessons to the current manager. Now that the manager have graduated from their fund management university, there is no need for the consultation fees. JPY 32 mil and 274 mil translates to SG428k and SG$ 3.7 mil. If we judge the price to income that Croesus shareholders are paying for the fund management now its 116 times. That doesn’t make sense. If we view it from the private equity acquisition angle, where if instead of internalization, I purchase the asset manager, I am concern about how much future EBITDA or cash flow i could generate from this. 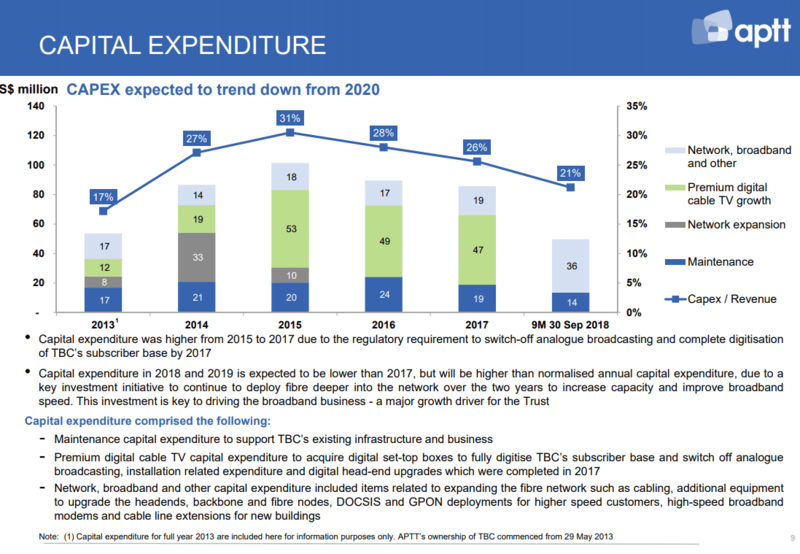 In this way, we should be looking at SG$3.7 mil in net income. At SG$50 mil, the shareholders would be purchasing the manager at 13.5 times income. Not cheap, but not too expensive either. When Frasers Centrepoint bought over Allco REIT’s manager in 2008, it was at 3.8% of AUM and 10x management fees. If we put the internalization side by side with them, Croesus have existing 96 bil Yen of properties, and the 2 sets of new acquisitions would add 6.1 bil and 3.3 bil respectively. Total investment properties to be manage is around JPY 105 bil. This translates to SG$1.4 bil. 3.8% of SG$1.4 bil is SG$53 bil. When Frasers Centrepoint bought over the manager it was in the GFC. This makes Croesus internalization deal not look too expensive. So after the proposal, the management do think the shareholders need additional assurances. 7. If Internalization is Beneficial to the Shareholders….. These 3 deals happen in a short span, in the time frame of business deal making. Shareholders could have benefited if they pair this internalization with one of the purchases. Or that they could have internalize first then purchase the 3 properties. That will save the shareholders much acquisition and school fees paid to the sponsors. This sequence makes me wonder whether in a short span of 30 days, the sponsors and managers suddenly realize the shareholders can gain tremendous benefit in internalizing the management team and decide to propose to shareholders. My gut tells me its better to stay as an observer. Some will crash and burn some will present value. Do check them out here.